Finally! It's been a few years of an incomplete Bad Religion line-up releasing sub-standard material on a label not their own, but now Greg Graffin and Brett Gurewitz are back together on the label they started way back in the early 80s. And it's obvious from this, an album that can hold its head up high alongside the US punk rock classics of their back catalogue. Kicking off with the machine gun beats of 'Supersonic', it's three short sharp and ultra-fast tunes before the band seems to take a breath. 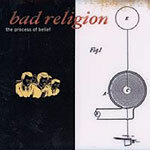 This is the Bad Religion that produces "Against the Grain". Then there's the slower, but no less sharp sounds of "Broken" or "Sorrow", reminding you that this is the band that also recorded "Recipe for Hate". The lyrics are as intelligent, wordy and meaningful as ever: religion on 'materialist', environmentalism on 'Kyoto now', their utopian hopes on 'Sorrow' or the powerful and heartfelt 'Epiphany' questioning the belief system that surrounds them. This is the CD that should do what "Stranger than fiction" failed to do in the mid-90s - blow away the young upstarts. This should, if there's any justice in the world, be bigger than anything the likes of Blink 182 release this year. This is 14 slices of pure unadulterated punk rock by the masters.